On April 3, 1945, Corporal Masami Yamamoto took off from Shiraho Airfield on Ishigaki Island toward Okinawa and died in a special (suicide) attack at the age of 19. He was a member of the 105th Hikō Sentai (Flying Regiment) and piloted an Army Hien Type 3 Fighter (Allied code name of Tony). After his death in a special attack, he received a promotion to Second Lieutenant. 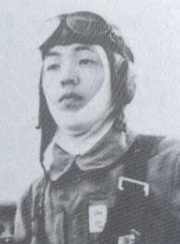 He was from Kagoshima Prefecture and was a member of the 12th Class of the Miyakonojō Pilot Training School. The long-awaited day finally has come. Now I obtained an opportunity to die splendidly for the Empire. I gladly go to die in order to destroy the enemy Americans and British and to defend the Empire's security. I trust that everyone certainly will not cry when I die. Rather than that, when you hear the news of the instant sinking of an enemy aircraft carrier, please be glad thinking that I made a taiatari (body-crashing) attack. You raised me with deep love for 20 years  since my birth. I apologize for my lack of filial piety in not being able to repay your kindness in any way. However, it is my duty as a military man to die splendidly for the Empire. I ask that you take care of things afterwards. Please resign yourself now to what happened to Older Brother. You raised Yoshitaka, Tadamitsu, and Mitsuno in an excellent way. Please let them show to you filial piety for the parts of Older Brother and me. Excuse me for always causing trouble for you in your old age. Well then, please live happily for many years. Now I go to smash an enemy aircraft carrier. I imagine that cherry trees are blooming already on the mainland. I will fall purely like a cherry blossom. Long live the Empire of Japan. A total of 31 Special Attack Corps members died in battle after taking off from Shiraho Airfield on Ishigaki Island. The Ishadō Monument at the former Shiraho Airfield honors Captain Yōkyū Ishadō, a native of Ishigaki Island, and the other 30 men who died in special attacks. The letter and biographical information on this page come from Chiran Tokkō Irei Kenshō Kai (2005, 100, 217) and Osuo (2005, 214). 1. The traditional Japanese method of counting age, as in much of East Asia, regards a child as age one at birth and adds an additional year on each New Year's day thereafter. This most likely explains why the letter indicates his age as 20 whereas Chiran Tokkō Irei Kenshō Kai (2005, 100) indicates that his age was 19 at time of death.